Thanks to the growing support of our community, nearly 2,500 young people experiencing homelessness received help, hope and so much more! Thank you for your commitment to ensuring that every young person can reach their full potential. Read more about our results, financials, supporters, events and special guests throughout the last year in our 2017-2018 Annual Impact Report (click here to view). To address these issues and build on this momentum, we are working harder than ever – serving more young people, offering additional programs, and deeper supports – and seeing the impact. A full 83% of young people who complete our housing programs have a safe and stable place to live when they leave. Not only that, they are working or in school, and successfully managing their physical and mental health. Our services make this possible, but these outcomes are a testament to the resilience and tenacity of the young people we serve. 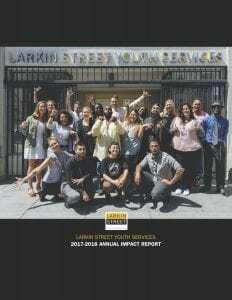 As we look to the year ahead, Larkin Street remains committed to eradicating homelessness for every young person. While the need is great, we have the foundation for success. We are working diligently with city- and community-based partners to inform a systems approach that makes any instance of homelessness among young people rare, brief, and non-recurring. Crucially, that system must work most effectively for youth of color and LGBTQ-identified youth, who are over-represented among those who we serve. It is possible to create a world in which youth homelessness does not exist. Our new agency-wide strategic plan, which will launch in 2019, pursues this vision as our guiding light. We will continue to work at the local, state, and national levels toward that goal, building on the successes of our staff and youth. None of this would be possible without the incredible support from our elected and government officials, corporate partners, volunteers, donors, and many more. This support hit a record high last year, and for that, we thank you! Ending youth homelessness is truly a community-wide effort. 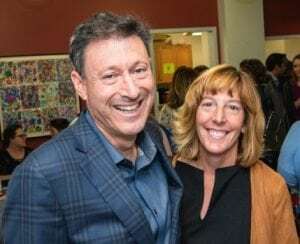 We know that with our model for intervention, the dedication of our committed staff, and the invaluable support of the community, we have what it takes to make a real difference – for our youth and the community at large. Thank you for helping make both our youths’ dreams, and our mission, come to life. To view the full 2017-2018 Annual Impact Report, click here. Interested in learning more about how you can help? Get involved with Larkin Street.